About Roger J. Muller, Jr.
Have you ever dove in Cuba? For years I envisioned what the underwater environment would look like? Fortunately, I was able to go to Cuba on a Peoples to People program and ended up doing some Lionfish research in Central Cuba. On my first dive, I bought my camera and Go Pro to track the Lionfish in the area. I found out there are tons of large Lionfish in low water areas there and the fish seemed to herd together. While taking photos a few times, I almost got poked by Lionfish that were floating near me. Every-time I got close to the Lionfish with my video camera the fish would go into their defensive mode by turning their top spines towards me. Lionfish are one of the most beautiful fish underwater, but as everyone who dives know, they do not belong in the Caribbean waters and have no predators. As I viewed in Cuban waters, the Lionfish were alive, well and spreading quickly. Since there are not a lot of boats in Cuba, their seas always had more fish than other Caribbean Islands. Most people can’t even afford fishing rods there, so the tropical fish and game fish pretty much had a safe haven for years. This all ended when the Lionfish showed up around 2010 or so. Little by little the Lionfish are destroying the beautiful untouched reefs in Cuba. After viewing this issue and tracking Lionfish in Cuba I decided my next dive I would have to kill some of them. After finding Pedro a Dive Master, we did a shore dive with a spear gun. I spent most of the time observing how Pedro would shoot the Lionfish accurately and then take his dive knife out and remove all the spines from each Lionfish and then deposit them into his buoyancy control device aka BCD pocket. 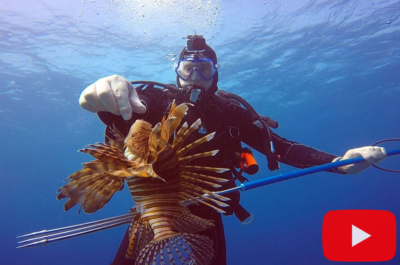 After completing many more Lionfish hunts over the years, I found this practice of taking the spines off the fish to be unsafe and time-consuming. In over an hour that we dove before it got dark, we only speared 12 Lionfish. Pedro killed 10, and I shot 2, and unfortunately, my kills were not recorded since my video camera died. I figured right here it is a good time to expand on my above comment of wasting diving time removing the Lionfish spines underwater. It wastes valuable diving time. The more time you have underwater most likely, the more Lionfish you will kill! It is not safe to cut spines off underwater as we did in the video without using proper gloves for protection. Everyone thinks they are an expert and will be careful and they believe so until they get poked by a venomous spine by mistake. It is not fun and takes it from me. 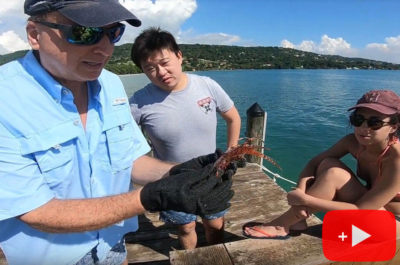 You can see me getting stung in my video on YouTube titled Getting Stung By a Lionfish-What Not to Do! Being an experienced, professional scuba diver and Lionfish hunter, I recommend always using an underwater containment device. The best product I have found is the Zookeeper made in Sarasota, Florida by hand. They are safe, secure to use, and they travel well in my suitcase. My fellow instructor and friend Allie ElHage makes them in his garage. Anyway, there are a few reasons why diving like we did in this video is not recommended. We were lucky no one was hurt. I hope one day soon to go back to Cuba and hunt Lionfish and teach others divers in Cuba how to properly spear, track and kill Lionfish. 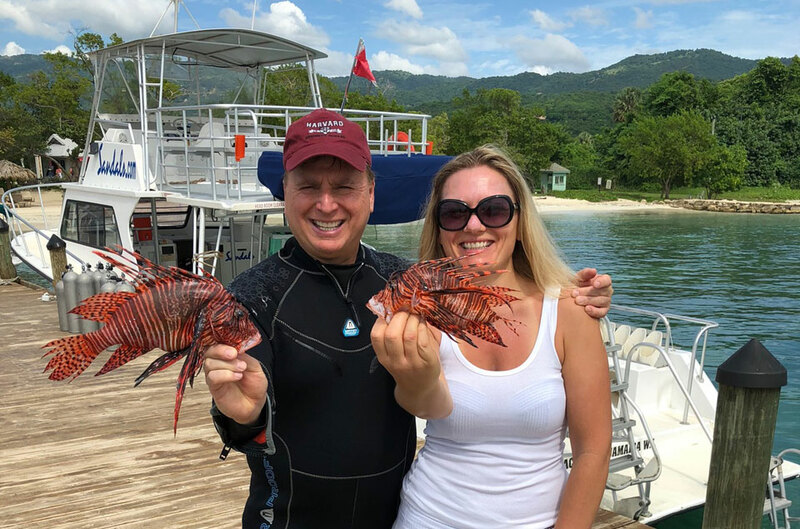 Becoming a Lionfish tracker and hunter is not hard to do, but it takes a lot of experience to learn how to avoid hitting coral, other divers and adequately spearing fish without injuring yourself and others also. 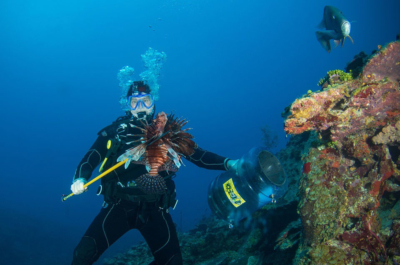 Roger J. Muller Jr., from New Jersey, is an experienced International Lionfish Hunter and professional scuba diver certified with both PADI and NAUI that has hunted the fish in ten countries including Cuba, Aruba, Jamaica, St. Croix, Bonaire, Bahamas, Grand Caymans, the United States, Curacao, and Panama… He kills Lionfish to restore the natural balance in these areas and prevent the marine animal from causing any more destruction to the coral reef ecosystems has a dove in for over 20 years. After graduating with an Environmental Science Degree and honors from Ramapo College in Mahwah, NJ, Roger went into the insurance industry. He is an Insurance Agent and owner of Muller Insurance, Est. 1906 in Hoboken, NJ. However, he felt that he had let his teachers down by not pursuing a career in the science field. With that in mind, he looked for ways to use his degree differently. He found use of his education was when he explored scuba diving for the first time in 1998. He immediately fell in love with the sport. 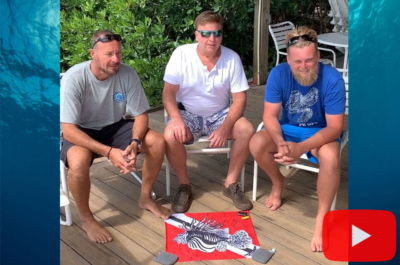 After completing over 111 diving certifications from the Professional Association of Diving Instructors (PADI) and the National Association of Underwater Instructors (NAUI), he became interested in the Lionfish issue after hearing about it on a dive trip about seven years ago. 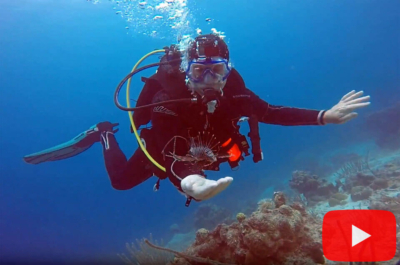 After that initial exposure, he took a handful of Lionfish training courses, including the SDI Underwater Hunter & Tracker, DAN & NAUI Hazardous Marine Life, PADI Lionfish Awareness and Elimination, PADI Lionfish Hunting Specialty, PADI Invasive Lionfish Tracker Specialty courses. Today, he has over 1,500 Lionfish kills! Roger, last year because of a field reporter for Lionfish University who is a group that is dedicated to preserving our oceans, reefs, native fish populations and raising awareness of the importance of maintaining our fragile ecosystems. I can be reached at roger@mullerinsurance.com and love to teach and educate others and spreading the word about how Lionfish are ruining the reefs of the Atlantic and Caribbean Oceans.